While I haven't played with it a lot yet - and might not, ever - Word Science is ok as a game if it were free. Now, don't get me wrong, I certainly didn't pay $0.99 for this. If you don't know, Starbucks usually has a card at their check out for a free iTunes thing per week. Sometimes it's a song, but most times it's a game. Most have never been for keeping. I'm not sure Word Science is either. Four lines of moving letters, every other line moving a different direction. You tap letters to spell words. As many as you can during a timed period. Since the letters are moving, sometimes you get distracted. Or maybe it's only me. 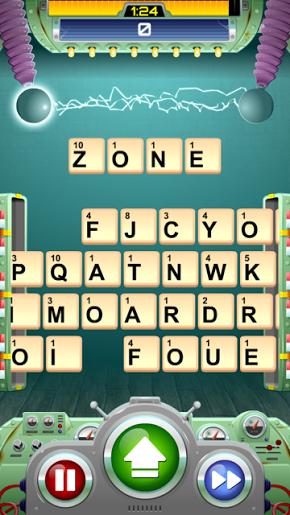 If you throw letters up there (just by touching them on their assembly line) you can rearrange them after they get up to the upper level (where 'zone' is shown). See that "electricity" between the two conductors? That's how they make "Weird Science" into "Word Science". Clever!!!! Oh, and up in that electricity, they will have a word "suggestion" for bonus points. Naturally, those letters are fewer and farther between, which eats up your allotted time - - and then you run out of it. It's not rocket science. I mean, there might be levels I have not gotten to, but I'm not all that broken up about it. 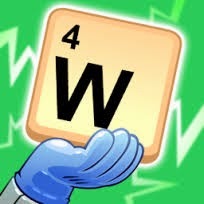 Word Science is ok for a time kill, but I do not see it replacing Words with Friends. However, I have used those frequent words we all use in that game for spelling things out in this new app. I'm pretty sure it's not worth a buck, but if you can still get it for free, that's about all you want to pay for it. Not for me...I'm terrible at spelling. Besides, I'm still working on 2048. I've almost done it but I couldn't get the two 1024 tiles to touch.